→How Long Does A Round Of Golf Take? I’ve always felt that there is no better way to spend a Saturday afternoon than on the golf course. That said, every once in a while, when life gets particularly busy, there is no shame in wondering just how much of that afternoon you’ll have to spend. Life can get hectic, and golf certainly doesn’t have a reputation of being a quick game. Just how long does a round of golf take? Actually, the answer depends on a few factors. Read on to see how long you can expect to spend on the golf course in any situation. How Many Holes are you Playing? Everyone who has ever stepped foot in a pro shop knows that most courses give you the option to play either 9 or 18 holes. Eighteen is considered a full round, but it also is going to take more time. The average eighteen-hole round can take between 3 ½- 4 ½ hours to complete, depending on skill level and course traffic. Nine holes can take between an hour and a half, and three hours, depending on the same factors. How Many People are you Playing With? It almost goes without saying that playing by yourself is faster than playing with two or three more people. How much faster depends on a wide array of variables, but you can usually count on a solo round falling within the lower range of the time frame, whereas playing with a foursome will generally fall within the higher range. That said, a slow hacker may struggle to match a talented foursome’s pace of play. Technically speaking, riding in a cart will get you from the first tee to the last tee quicker than your feet will. Personally, I have always found that I play better when I walk, and when I play better, the round goes faster. 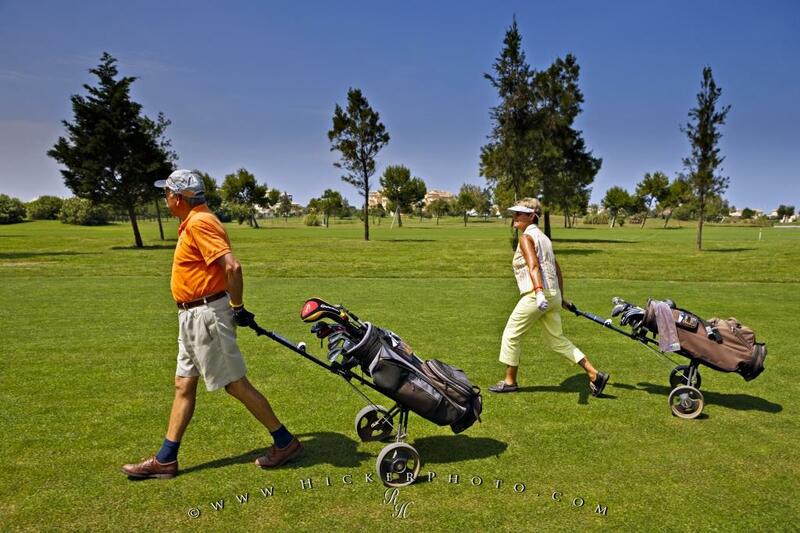 If you are playing with a partner, it may even be a little bit faster for you both to walk, since each of you will go to your own balls rather than traveling together in the cart. It really depends on your playing style and skill level. On a crowded day at the course, the difference between riding and walking will be minuscule, but if you have the links all to yourself, you could expect to save a half hour or so riding during an eighteen hole round. The hackers out there are probably hoping I’ll say scratch golfers take the longest. Nope! On an average day when course traffic is flowing nicely, high caliber players can expect to play each hole in ten minutes, while people with higher handicaps might take between 15-20 minutes. While there are exceptions to every rule, the reason for this is fairly self-apparent: It takes less time to put the ball in the hole from the fairway than it does from the woods. The average course comes in at between 6800-7200 yards, depending on what tee boxes you play from. That isn’t exactly what I mean when I talk about course length. Most full-length courses will take roughly the same amount of time to complete, even if they do have an extra par 5 or two in there. What we are really discussing here is the type of course you are playing. A standard golf course consists mostly of par 4s, with a couple of par 5s, and par 3s scattered amongst each nine. Every course is different, obviously, but this is a layout that you can more or less count on. There is another course format that is relatively common, and it can make a big difference when it comes to play time: The Par 3 course. The par 3 course is exactly what it sounds like. Every single one of the 9 or 18 holes that you play throughout the duration of your round will be a par 3. Obviously, the abbreviated length is going to make the round go by much quicker. On a day where course traffic is smooth, you could expect eighteen holes of par 3 golf to take under three hours, even when playing with a foursome. Par 3 courses are great for beginners not comfortable with their drivers, and they are especially great for players that want to get a full 18 in without spending all day doing it. The twelve-hole course is more of a prototype idea than it is a thing you should actually be looking for at this time. The Golden Bear himself, Jack Niklaus, is a huge proponent of making golf a little more beginner friendly and believes that one way to do this is to shorten the rounds. He has been championing twelve-hole golf courses for years now, and while they haven’t exactly taken off, some do exist, and in fact, he has even opened one himself. I’ll include a link here so you can read more about it if you wish to. As you can see, thanks to a slew of variables, the length of a golf round can vary tremendously. Your best bet for a quick round is going to be the Par 3 course. If that is all you have time for, great. It can be nice to get a round in without it dominating the entire day. Still, I have always found that golf is easiest to enjoy when you let time melt away. If you go into your round understanding that it may take 3-4 hours, I believe you won’t focus so much on the hacker in front of you that is slowing you down, nor will you forgo your pre-shot routine to get home sooner. I understand that we all have our time frames. Whether you only have time for the par 3 course, nine holes on a full length, or a complete round of 18, just remember that golf is a marathon, not a sprint. If you play it one shot at a time and allow yourself to get lost in the round, you will have fun, regardless of if it takes two hours or four. Have questions? Leave us a comment below!